We may never get a good Fantastic Four movie, but Disney is giving us the next best thing. Arguably a much better thing. After more than a decade, we finally have our first look at Pixar's The Incredibles 2. Though, we don't get to see much. Director Brad Bird is finally returning to the world he created in 2004 by bringing us one of the most highly-anticipated superhero movies of 2018. And considering that Avengers: Infinity War is also coming out next year, that is a bold statement. But a deservedly bold statement. Disney released a synopsis for the movie along with an image and poster. "Everyone's favorite family of superheroes is back in Incredibles 2 but this time Helen (voice of Holly Hunter) is in the spotlight, leaving Bob (voice of Craig T. Nelson) at home with Violet (voice of Sarah Vowell) and Dash (voice of Huck Milner) to navigate the day-to-day heroics of "normal" life. It's a tough transistion for everyone, made tougher by the fact that the family is still unaware of baby Jack-Jack's emerging superpowers. When a new villain hatches a brilliant and dangerous plot, the family and Frozone (voice of Samuel L. Jackson) must find a way to work together again, which is easier said than done, even when they're all Incredible." Director Brad Bird and the producers of the movie were on hand at Disney's D23 Expo over the summer to talk about the highly-anticipated sequel, but they didn't release any footage. Disney and Pixar decided to make us wait, but they recently released a little teaser online that didn't have any actual footage, promising that the Incredibles 2 teaser trailer was indeed coming. 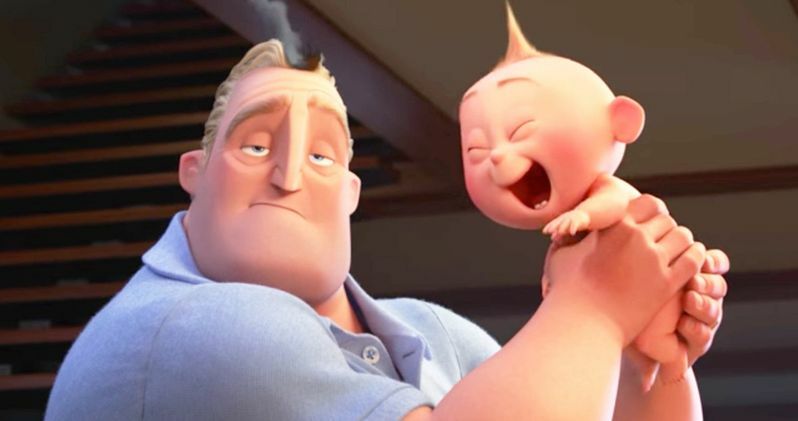 They made good on that promise as the footage is now online This is our first real look at The Incredibles 2 and it mostly shows us baby Jack Jack using his powers, with Mr. Incredible quite the proud pop. Mr. Incredible (Craig T. Nelson), Elastigirl (Holly Hunter), Frozone (Samuel L. Jackson), Jack Jack (Eli Fucile/Maeve Andrews), Violet (Sarah Vowell), Dash (Spencer Fox) and Edna Mode (Brad Bird) are all set to return in The Incredibles 2. Luckily, even though it has been such a long time since the original movie arrived in theaters, Pixar was able to corral everyone in order to make a proper sequel. What would an Incredibles movie be without Samuel L. Jackson as Frozone? Maybe he'll have better luck keeping track of his super suit this time around. Brad Bird got his start directing animated movies like The Iron Giant, Ratatouille and the first Incredibles, which remain his most beloved efforts to date. He then moved on to try his hand at live-action, with Mission: Impossible - Ghost Protocol, which went really well. Many consider it to be the best Mission: Impossible movie to date. His next live-action effort, Disney's Tomorrowland, didn't go quite as well. The ambitious flick was a miss with critics and something of a bomb at the box office. So, Bird has returned to finally do The Incredibles sequel we've all been wanting to see since 2004. Better late than never. The Incredibles 2 was originally supposed to come out on June 21, 2019, but Disney decided to bump it up by a year to June 15, 2018, and bumping back Toy Story 4 to that 2019 date. It isn't likely anyone is going to complain about that. The original Incredibles remains one of Pixar's most beloved movies and it was a major hit at the box office, bringing in $633 million back in 2004. Given how long people have been waiting to see the return of the supers, we can guess this will be a big hit for the studio as well. Be sure to check out the first teaser for The Incredibles 2, courtesy of Disney and Pixar, for yourself below.